Tape recorders that use spools of magnetic tape transfer the tape from one spool to another as the tape plays/records. The spool with less tape must be rotated faster than the other. 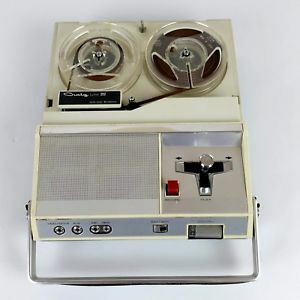 Here is such a tape recorder/player. This is the Craig Model 212. At start, the spool with all tape rotates slowly and the empty spool rotates quickly. As the tape plays and tape transfers to the initially empty spool, the situation is reversed. In order to prevent tape from breaking and play/record at constant rate, we must finely adjust the angular velocity of each spool in real time. The angular velocity of each is a function of the amount of tape on the spool. Tape recorders have existed since before transistor was invented, before microprocessor was invented. What type of circuit/electronics was used to control the speed of the tape and how? Figure 1. The tape head and drive system. Image source. Beneath the tape head cover on your photo is the capstan drive. A pinch roller presses the tape onto the capstan which runs at constant speed. (This is the critical constant speed control which insures accurate pitch control through the length of the tape.) The unwind reel is gently retarded by a brake and the take-up spool is driven by a mechanical clutch. (Obviously) the take up spool gearing has to be set to run quickly enough to take up the fed tape while at minimum reel diameter. It will slow down as the spool fills up. For fast forward or rewind the speed will vary with the driven reel diameter. All of the tape motion was driven by one constant-speed motor. The capstan was driven at constant speed by the motor. The various functions of the spools were controlled by engaging and disengaging drive wheels and belts. Clutches could be anything from simple felt disc between two sprung plastic clutch plates to fluid clutches, etc., depending on the quality of the machine. Some used 'dancer' arms to control the clutch to maintain constant tape tension with varying reel diameter. The rotation of the tape spools was not the thing that regulated the tape speed in front of the recording/playback head. Instead the tape speed was controlled by a shaft and pinch roller that operated at a constant speed with the tape passing between this shaft and the pinch roller. This mechanism was called the capstan. The reels were designed to follow the motion of the tape as regulated by this capstan. The feeding reel could just be free wheeling while the take up reel required some type of energized drive to wind on the tape. There were various methods used to apply the drive to the take up reel many of which were mechanical in nature. The reels weren't speed controlled (during "play") - they were torque controlled. The feed reel often had a weak mechanical brake, and the takeup reel was often driven with a slipping belt drive - faster than needed, held down to speed by the capstan feeding tape at constant rate. "Pro" decks (the EMI TR90 and some others) had their spools mounted on AC motors driven via large resistors to limit torque during Play, while for FF and Rewind the resistors were switched out to wind their 10.5 inch diameter spools as fast as possible. No such attempt, there was different attempts only to keep tape tension in acceptable limits. Simple methods such as torque limiting with slippery parts and resistor in the reel motor supply circuit are already explained by others. The regulating circuit give to the reel motors such voltages that the known bending force caused the wanted position of the bending arms. The regulating cleverness can today be in a computer program, but before modern microprocessors it was analog circuitry. 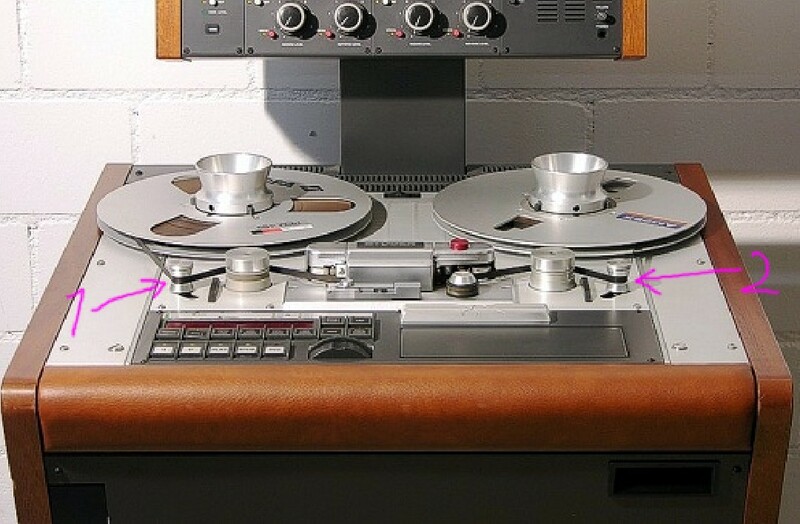 In addition to tape recorders (or 'decks') for analog audio signals, conceptually similar but bigger and more expensive reel-to-reel magnetic tape drives for digital data were used by earlyish (about 1950-1980) computers; see https://en.wikipedia.org/wiki/9_track_tape for some examples. Note these were almost always mounted vertically; some audio decks also were vertical, especially if they were intended to be mounted in equipment racks along with other related electronic devices like amplifiers, receivers, transmitters, signal processors, etc. Because computers in those days had very small working memory by today's standards (less than modern microprocessors have in L1 cache) they generally needed to read and write magtape data 'blocks' separately; this required the ability to quickly accelerate the tape from being stationary to fast enough to read or write, keep it moving at high but constant speed, then equally quickly decelerate it to a stop, all without putting stress that would stretch (or even break) the tape. Some lower-speed drives did this with spring-tensioned mechanical follower or 'idler' arms, similar to user287001's answer, but most used so-called vacuum columns. These pumped some air out of a closed channel so that a modest pressure difference (not a true vacuum) would hold a U-shaped 'loop' of tape at its full length, with little stress. As tape was moved past the heads by the capstan, one loop would get longer and move down the column while the other would get shorter and move up, and pressure sensors in the columns would detect these movements and turn on and off the reel motors as needed to supply more tape to the now-short loop and 'take-up' tape from the now-long one. Nerds in those days (including me) would jeer at movies and TV shows which would often show purported computers and tape drives, but have both reels spinning continuously at the same speed, when real ones turned in short jerks, independently and separately, under control of the vacuum-column or idler sensors. When microcontrollers became capable enough around 1980, there were some 'streaming' drives for what was then considered 'standard' magtape, which used more complicated control algorithms to drive the reel motors directly, with slow enough acceleration and deceleration to protect the tape, and much larger buffers to usually allow reading and writing many blocks at a time. However by this time disks had become (much) bigger and cheaper and replaced tape for most data storage, and for backup and transport much smaller (but higher-density) cartridge and cassette tape formats were developed and largely replaced 'reel' tape. The previous commenters are generally correct. What they do not make explicit is that the tension of the tape against the record and play heads needs to be precisely controlled. Otherwise there will be problems with irregular tape-to-head contact, resulting in dropouts in the recorded/played signal. There are two basic designs that accomplish this: 1) Pressure pads (made of felt or similar material) press the tape against the heads. Inexpensive consumer machines used this method. Or, 2) the tape tension coming off the supply reel is precisely regulated, usually by a supply reel motor, in combination with a spring loaded tape guide lever, to ensure consistent tape-to-head contact. This latter method is typical in high end professional machines. Not the answer you're looking for? Browse other questions tagged analog control or ask your own question. How to stabilize this control system? DALI : How commissioning process takes place in DALI system? How do I find the second order transfer function from this step response diagram? How to design an auto-adjusted equalizer? How do I come up with a list of requirements for a microcontroller for my project? How can I then find microcontrollers that fit? How does feedback make a system stable even in the presence of an inherently unstable element in that?